Today was scheduled to be my post about firefighters, and an interesting and timely thing happened yesterday that I’d like to share. 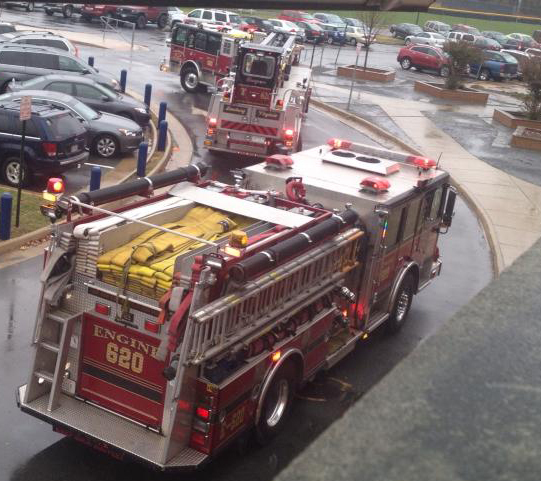 Yesterday at the high school where I teach, it was raining when the fire alarm sounded. The students and I all looked at each other. We all knew that planned fire drills are never conducted in the rain, especially rain as cold as it was yesterday. This was either someone playing a prank, a terrible mistake, or the real deal. We hurried outside, everyone huddled together to stay warm in the rain. A moment later, a fire truck arrived, followed by several police cars, another engine, an ambulance, an SUV… phones emerged as students recorded the action. The second engine to arrive pulled up to the fire hydrant, attached the hose, and continued down the drive, the hose unraveling as the engine continued toward the area in question. Eyes bulged open. There might be a fire. The other engine was raising its ladder. I wondered whether I had any dry clothes in my car—I figured, as long as this might take, I’d likely be soaked by the time we were allowed back in the building. I also wondered about the students. How terrible would it be to have to sit through classes wet and cold after standing and waiting in the rain? I watched the efficiency with which the firefighters inspected the scene. They worked quickly with the administration to determine the location of the incident, and before long, the entire school was being directed back into the building through a prescribed route into the safety of the auditorium. We were told which hallways to avoid while the smoke was being cleared. On the way in, the smell of smoke was strong and pungent. This was the real deal—an electrical fire? Although I do not have the full, official story, we were told that the fire department had to vent the smoke out of the building before we would be allowed back into the corridors. “I’m in seventh grade,” she said. “My dad’s a firefighter here. He’s been teaching me about fire safety all my life, and after what happened last year, he thought I should start volunteering.” She smiled proudly. “What happened last year?” asked Gavin. Spark emulates the passion her father has for being a protector, for saving others. I saw that passion in action yesterday. Before the incident happened, I wanted to write my entire post about the concept of volunteer firefighters—how many dedicate their time to saving the lives of others, and how many of them are able to raise money from the community because of the important nature of their cause. With citizens paying taxes for all manner of services—some worthwhile and others questionable—it amazes me that one of the most important services, firefighting, is often paid for voluntarily, right out of the pockets of citizens. It’s a true testament to the heroic nature of the cause. For several years, I have been privileged to support one of the local fire companies in Adams County, Pennsylvania, and learn more about firefighting in the process. Recently, I had the opportunity to talk to a local Virginia firefighter, and he explained just how important volunteers are to most fire companies—even ones partially funded by tax dollars. He explained the way shifts are divided up—and how most firefighters have other jobs outside of firefighting or have long shifts during which their families worry about their safe return. Knowing this, I was touched while watching the firefighters in action at my school. It put the concept of “having a bad day” into perspective. Just moments earlier, students were complaining about being tired, or having too much homework, or simply wanting Thanksgiving break to arrive. But seeing the efficiency of the firefighters made me realize that, like any life-saving professions, firefighters must block out any distractions and focus only on the task at hand. Lives and property depend on it. As Thanksgiving approaches and students prepare for time away from school to sleep in and visit with family, I realize that we live in a world with brave and caring people who look out for each other and risk life and limb to make the world a better place. And that’s something to be thankful for all year ‘round. I’ve already blogged about the winners of the Name that Cat contest (and about cats as well) and the inspiration of one of the winning names. Being inspired to enjoy life is a constant theme in Corgi Capers, as Zeph (inspired by my own fraidy-dog Yoda) is afraid of most things. Many characters volunteer and push beyond their comfort zones, learning to find the heart of a hero beating within, often taking inspiration from neighbors and the bravery of firefighters. Curious to learn more? You can view the trailer here. I’m pleased to be working with Yuming Cao to bring this bravery to life through illustration, and a new, illustrated corgi book will also be available soon. Posted on November 18, 2014, in character, corgi, corgi capers, giveaway, inspiration. Bookmark the permalink. Leave a comment.